You meet lots of people in the real estate business – some nice and some not so nice. The National Association of REALTORS® has recognized the need for thorough training and information on how to maximize REALTOR® safety and we at NOMAR certainly want to do our part to keep our members safe. 2016 NOMAR President Lesha Freeland understands the need to increase awareness on REALTOR® safety issues and has chosen this as her initiative to champion during her presidency. We hope you’ll use the resources on our website and on the NAR Safety Portal to keep yourself protected and to learn how to avoid potentially dangerous situations. NAR has compiled a comprehensive resource for various apps and products focused on REALTOR® Safety. NOMAR does not sponsor or support any particular application or product, but we have highlighted three of the best apps from the NAR site. The NAR-sponsored app, React Mobile, is a personal safety solution that turns your smartphone into a powerful lifeline. With this free app, you can let a wide network, including the local authorities, know where you are and that you need help. Their safety app features a “Follow-Me” function so you can let your trusted contacts know where you’re going and how for how long. The React Mobile smartphone app is availablefor freeto download on iTunes, Google Play and the Amazon App Store. Another app, Agents Armor, is designed specifically for real estate agents to alert brokers, emergency contacts and authorities everything they need to know about your appointments. The app allows you to let your broker and your emergency contacts know you are on a showing. With the voice memo feature, you can give a description of your client and his/her car; you can even take photos, which is uploaded to a secure server. Throughout the showing, a safety alert checks in to make sure you are safe. If you do not respond, your broker, emergency contacts and the authorities are notified with your GPS coordinates. Finally, SafeFi is a free app that can be used in any dangerous or uncomfortable situation to instantly alert family, friends, co-workers and 911 that you need help. SafeFi utilizes a patented technology called SNAPP that turns your power button into a rescue button. No need to unlock your phone or navigate through apps, just repeatedly press your smartphone power button and an alert is sent with vital information and GPS coordinates to your network and 911 if needed. For a full list of Safety Products and Applications for Smartphones, click here to see the list from NAR. NAR has also provided an extensive list of safety tips and information for REALTORS®. We have featured a few below, but to see the entire list of 56 safety tips from NAR, please click here. Click here to view additional safety tips from NAR. In addition to providing you with helpful tips and resources, we also want to provide you with the practical training and knowledge necessary to protect yourself in case the worst happens. 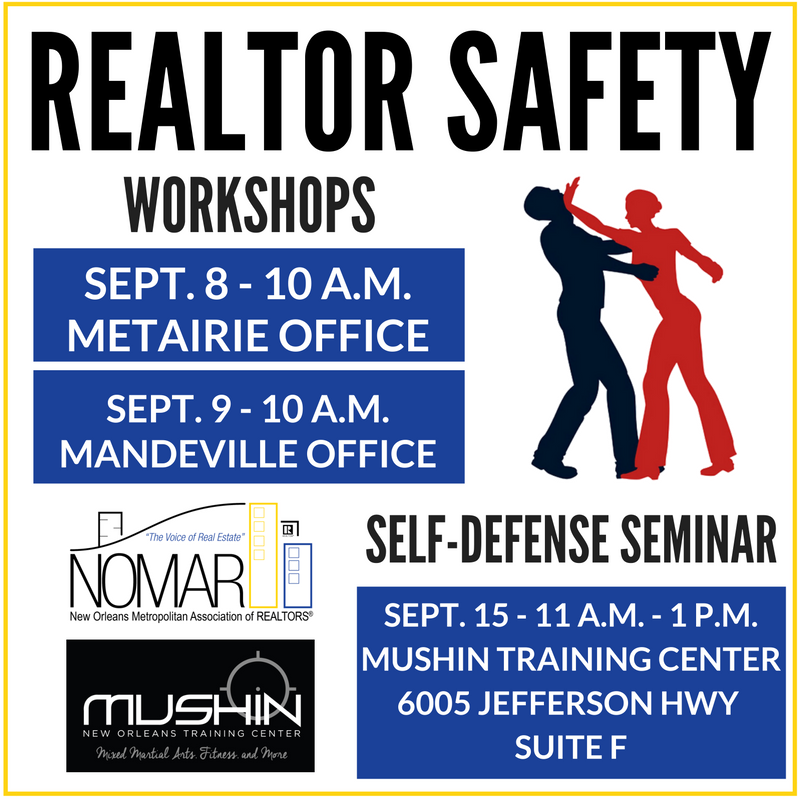 Sign up here to enroll in our REALTOR® safety course from NAR on Sept. 8 (Metairie Office) and Sept. 9 (Mandeville Office) from 10 a.m. – 12 p.m.
We are also excited to announce that we have partnered with Mushin Training Center! Thanks to our partnership, we will be offering 3-hour self-defense seminars to our members for just $25 a session. Click here for more information on the seminar. If you are interested in joining Mushin Training Center as a member, please click here to see their corporate partner pricing levels. The self-defense seminar will be held on Thursday, September 15 from 11 a.m. - 1 p.m. at Mushin's location on 6005 Jefferson Hwy, suite F, in Harahan. Click here to register for the seminar. For our Northshore-area REALTORS® who would like to attend a self-defense class in St. Tammany Parish, the St. Tammany Parish Sheriff's office is hosting a three-seminar course called "Lady Beware" which begins on Saturday, September 24 at 8 a.m. For more information, please click here. Did you know you can send a Distress Alert with your Xpress Key with the Alert Feature? These alerts are designed to be sent out in real-time, as quickly as you can receive a text message, is how long that alert takes to reach their designated contacts. To set up the alert feature, you must you go into your SupraWeb account and set up who you want the predetermined message to be delivered to. Then, when the alert button is pushed and held for about three seconds, the email is sent to the recipient’s email address immediately, as long as the agent is within cellular coverage.